This week in gold we saw precious metals, particularly silver, fly off the shelves amid low prices and high demand. The U.S. Mint reported record sales of bullion coins during the month of October, and said on Wednesday that its American Silver Eagle coins are temporarily sold out. We also summarized the World Gold Council’s latest report, which gave four reasons gold makes a valuable portfolio component. The World Gold Council (WGC), the market development organization for the gold industry, released its latest edition of Investment Commentary, in which WGC examines the economic factors that may influence gold’s performance in the near future. The report also analyzes why current market conditions are supportive of long-term growth for gold, and concludes “there are four main reasons investors should view gold as a valuable portfolio component today.” Read Tuesday’s blog to see what those four reasons are. Demand for U.S. Mint bullion coins surged in October, with silver and gold coin sales at their highest since January 2013 and January 2014 respectively. An impressive 5.79 million American Silver Eagle were sold, a 39.9% increase from September’s sale of 4,140,000 coins. American Gold Eagle sales totaled 67,500 ounces, a 16.4% increase from the September total of 58,000 ounces. American Gold Buffalo sales reached 21,000 coins, a 44.8% jump from the previous month. Read more in Wednesday’s blog. The U.S. Mint said on Wednesday that its 2014 American Silver Eagle coins have temporarily sold out, facing “tremendous demand in the last several weeks.” The news was not announced to the public, but a spokesperson confirmed that a statement was sent to the Mint’s authorized distributors. The statement also said the Mint plans to continue producing 2014-dated coins, but that it would let distributors know when more become available. For more information, see Thursday’s blog. No matter the supply or price, gold and silver have long been considered useful hedges against economic uncertainty. They offer tangible protection but also tremendous peace of mind knowing your assets are secure. 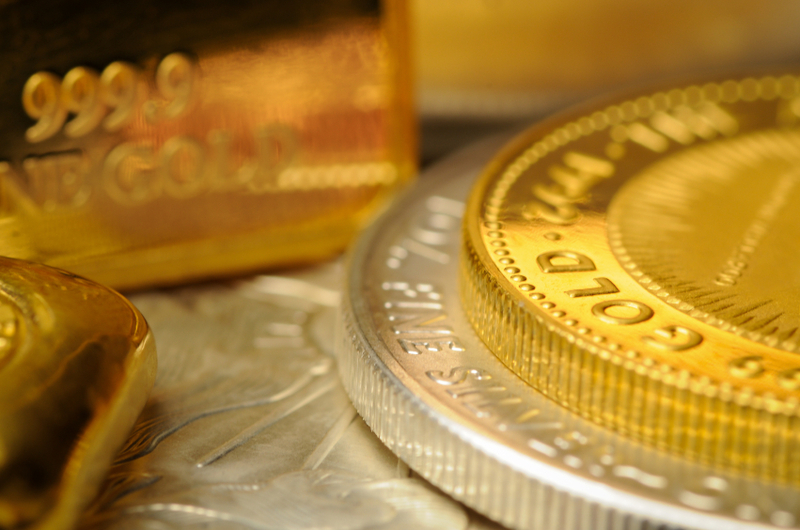 If you’d like to buy gold or silver coins and bars for direct delivery or even add them to your retirement portfolio through a Gold IRA, call American Bullion today at 1-800-326-9598 to speak with a precious metals specialist.